Here's what you need to know about the winter storm hitting the U.S.
CHARLOTTE, N.C. -- A massive storm brought snow, sleet, and freezing rain across a wide swath of the South on Sunday -- causing dangerously icy roads, immobilizing snowfalls and power losses to hundreds of thousands of people. Accidents on snow-covered interstates caused major delays, hundreds of flights were cancelled and drivers in North Carolina and Virginia got stuck in snow or lost control on icy patches. Meanwhile, kids and the young at heart took advantage of the early winter snow with snowball fights, sledding and snowmen. Police in North Carolina and Virginia said they'd responded to hundreds of snow-related traffic accidents as of Sunday afternoon, as cars, trucks and tractor-trailers all struggled with the snow and ice. North Carolina Gov. Roy Cooper strongly urged residents to stay off the roads Sunday, asking drivers not to put lives of first responders needlessly at risk. Cooper said emergency crews, including the National Guard, worked overnight to clear traffic accidents on major roadways. "Stay put if you can," Cooper said. "Wrap a few presents, decorate the tree, watch some football." Five members of a dive team searched the Neuse River in Kinston, North Carolina, for a missing truck driver Sunday after a tractor-trailer ran off a road and into the river, WRAL-TV reported . Officials warned residents to prepare emergency kits and stay off roads in impacted areas. 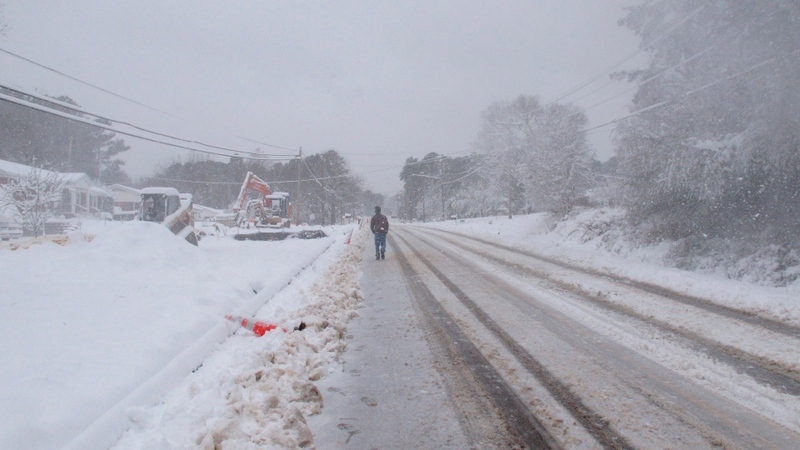 Several schools districts in North Carolina and Virginia announced they'll be closed Monday. The National Weather Service said a "prolonged period of snow" began late Saturday and would last until Monday in the region, with the heaviest snow expected in northwest North Carolina and southern Virginia. Some areas of North Carolina and Virginia saw more than a foot (30 centimetres) of snow by Sunday afternoon. More than 300,000 power outages were reported across the region with the majority of those -- about 240,000 -- in North Carolina, according to poweroutage.us. Parts of Alabama, Georgia, South Carolina, Tennessee and Virginia also saw outages. Charlotte Douglas International Airport, the sixth busiest airport in the country, said American Airlines reduced its operations, with more than 1,000 flights cancelled on Sunday. Travellers were advised to check their flight status before heading to the airport. Cancellations were reported on flights from as far as the Midwest. Sometimes even our very finest need a little bit of help during weather like this! And boy, do we have a lot of friends here in Lubbock, Texas! We're honored to protect and serve this amazing community - and especially thankful when they protect and serve us in return. The good news is the officer was able to get back to service after these good samaritans helped him out! Thank you so much!